Does this picture strike fear into your heart? It does for me. 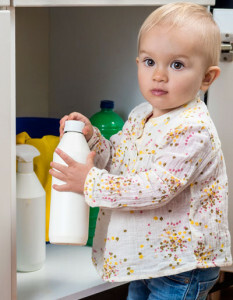 All moms know that despite our best efforts, kids will get into the cleaning cupboard under the kitchen sink. It’s best to get rid of those dangerous disinfectants and cleaners, replace them with something safer! The sniffling, sneezing, coughing, germs-flying-everywhere cold and flu season is here. As you know, we don’t use antibacterial soap–but that doesn’t mean that it’s a germ free-for-all at our house. Believe it or not, you probably have the two items you need to disinfect your kitchen and bathroom from cold and flu germs right now. Can you guess what they are? Yep, you’re looking at store-bought hydrogen peroxide and white vinegar. Surprised? These two everyday items combine to form an amazing germ-killing combo. The white vinegar at the store is a 5% dilution, which kills about 80% of germs. Pickling vinegar is a 7% concentration, which is more effective–I haven’t seen it in any stores around here, though. The hydrogen peroxide is the regular 3% dilution you can get at Target or the drugstore. It’s so easy to use hydrogen peroxide and vinegar to kill cold and flu germs. We use this combo in the bathroom, kitchen, and on doorknobs and light switches. 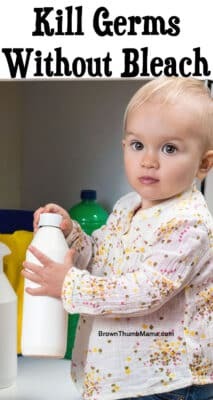 And unlike bleach sprays or wipes, they aren’t harmful to kids or pets. Step 1: Spray the vinegar on the surface you want to disinfect. Leave it sit for a few minutes, and don’t wipe it off. Step 2: Spray the hydrogen peroxide on the surface. Let it dry and again, don’t wipe it off. How does this work? The combination of vinegar and hydrogen peroxide forms peracetic acid, which is a powerhouse against salmonella, E. coli, and listeria. (sources: http://1.usa.gov/179jZCZ , http://bit.ly/HvHKcu) Amazing! You can put a spray nozzle onto the store containers or repackage into other spray bottles. Label the bottles clearly! Be sure to keep the hydrogen peroxide in an opaque container so it doesn’t degrade. Don’t mix the two in a single container–peracetic acid is very strong (how else would it kill the germs?) and shouldn’t be kept in a sealed container. If you don’t like the vinegar smell, use citrus vinegar instead of plain white vinegar. Don’t use this combo on granite, marble, or natural stone. Vinegar is acidic and can damage the stone. Hello Brown Thumb Mama! I thought you would say alcohol instead of vinegar! I use vinegar and baking soda all the time! Now I will try this method! And it’s per the gov’t! Thanks for sharing and have a great week! Blessings from Bama! You can also add some essential oils to boost their power and change the smell. Not sure if you can add EOs to Peroxide but I know you can add them to vinegar. I love to add Lemon or Cinnamon (or both) to mine. Can you have the peroxide and vinegar in ONE bottle? Or is it better for them to be in two? They work best if you leave them in separate bottles. Yes! We do this too. I normally use just peroxide on the kitchen and bathroom sinks and countertop on a weekly basis, but if anyone’s been sick I use the vinegar too. I also use peroxide to disinfect toothbrushes after illness (or if they get yucky in hot humid weather) when they are relatively new so we don’t want to replace them yet. Just put the brush bristle-end-down in a cup, pour in peroxide deep enough to 3/4 cover the bristles (it will bubble up between them to the top), let soak for at least 10 minutes, then rinse in warm water. Great tips! 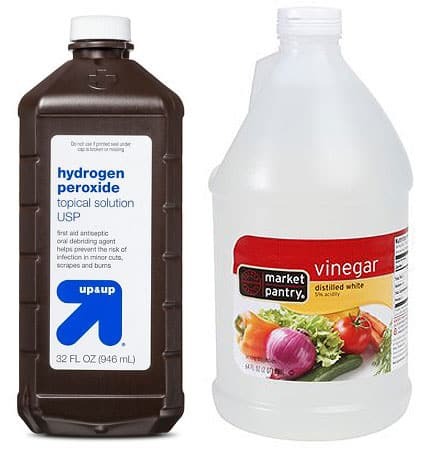 I’ve been using vinegar and hydrogen peroxide for quite a while … they work!! And (knocking on wood) we rarely get sick. Thanks, again! I despise bleach, I am so happy to have found your post today! Could you use this in the wash with whites?? I use peroxide and a little water with lemon EO to clean countertops and the bathroom. It works well. I guess I need to pick up a jug of white vinegar! Spray one on, let it sit for a few minutes, then spray the other. Let it sit and then wipe if you want to. I wipe the baby’s crib but don’t wipe the bathtub, for example. Do you know if you can use vinegar or peroxide in stored drinking water? I hate to put those drops of clorine bleach into water that we are storing for emergency use or for WTSHTF…..it kinda runs counter to my ‘organic’ way of thinking. Thoughts? My children and I are allergic to bleach. We have always used homemade lavendar vinegar or lemon vinegar. I will try this combo in the kitchen and bathroom for added benefit. Thanks for posting. Great Piece, I’m going to try it, since it is non toxic. I’m a big avid on using any sort of Vinegar even applying the apple cider vinegar kind to my skin as it helps against my Eczema. What products do you suggest using on natural stone, tile, etc? My floors & counter tops are tile/granite & my shower is natural stone. I got pretty sick today using bleach so I’m on the hunt for anything to kill germs, clean surfaces bright white, & safe my skin & lungs.